The Fund for Women is again partnering with local businesses this holiday season to host Giving Trees. 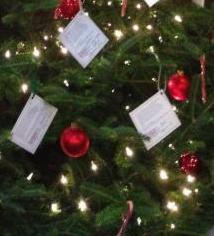 Gifts contributed through the trees address specific needs expressed by clients of the beneficiary programs. So as we busy ourselves with the joys of the holiday season, please remember the women in our community who truly need our assistance and support, and consider picking up a tag and returning a gift. Help make the holidays a bit brighter for women in need.